The Microbial Fuel Cell (MFC) can be a future environmentally friendly biotechnological application for the production of electrical energy. As a future alternative energy source, the bioelectricity generation must become more efficient. A major limiting factor is the low bacterial membrane permeability, hindering transport of electron shuttles through the membrane and thereby restricting the electron shuttle-mediated extracellular electron transfer (EET) from bacteria to electrodes. This results in a reduced electrical power output of the MFC. Therefore, we heterologously expressed the porin protein OprF from Pseudomonas fluorescens into Escherichia coli. Figure 1: Schematic overview of the enhancement mechanism of electron shuttle-mediated electron transfer between bacteria and the anode of MFCs by the synthetic porin OprF. Oxidized mediators diffuse into the periplasmatic space where they accept electrons. Reduced mediators are secreted through outer membrane porins and donate their electrons to the electrode. Heterologous expression of the porin protein OprF from Pseudomonas fluorescens into Escherichia coli leads to a much higher current output in comparison to its parental strain (E. coli KRX). This is most likely caused by improved electron shuttle-mediated extracellular electron transfer through dramatically increased membrane permeability. The heterologous expression of the outer membrane porin OprF from Pseudomonas fluorescens in Escherichia coli is a great genetic strategy to overcome limitations due to the membrane and to increase electricity generation by microorganisms. For the biobrick part, BBa_K1172501, there was a 24.3% of identity match and 51.3% similarity match to the top allergen in the allergen database. This means that the biobrick part is not of potential allergen status. In 80 amino acid alignments by FASTA window, no matches found that are greater than 35% for this biobrick. This also means that there is not of potential allergen status. The oprF gene from Pseudomonas fluorescens was cloned and heterologously expressed in Escherichia coli KRX under the control of different promoters (Table 1). Table 1: Overview of oprF devices. Combination of oprF coding BioBrick (BBa_K1172501) with different promoters and RBS. The characterization of this BioBrick was performed by comparing Escherichia coli KRX wild type with Escherichia coli KRX carrying BBa_K1172502, BBa_K1172503, BBa_K1172504, BBa_K1172505 and BBa_K1172507. Upon expression of the outer membrane porin protein OprF, the morphological and physicochemical characteristics of the E. coli surface were analyzed. SDS-PAGE combined with MALDI-TOF MS/MS, different membrane permeability assays (NPN and ONPG), a hydrophobicity assay and Atomic Force Microscopy (AFM) characterize the OprF BioBrick BBa_K1172501. OprF was detected in an SDS-PAGE with a broad overexpression band. Protein isolation of the outer membrane porin OprF by release of periplasmic protein fraction from E. coli via cold osmotic shock using Cell fractionating buffer 2.3 was successful. Figure 2: SDS-PAGE with Prestained Protein Ladder from Thermo Scientific as marker. Comparison of protein expression between Escherichia coli KRX wild type and Escherichia coli KRX with BBa_K1172502, BBa_K1172503 and BBa_K1172507 after periplasmic protein fractioning with Cell fractionating buffer 2.3. The band used for the MALDI-TOF MS/MS is marked with an arrow. The SDS-PAGE shows a significantly higher protein concentration in extracts from E.coli expressing OprF from a T7 promoter (BBa_K1172502). This is most likely caused by the higher membrane permeability (shown with NPN and ONPG uptake assay), allowing an increased release of membrane proteins by 0.2 % SDS. Nevertheless, a strong overexpression band can be observed at the expected OprF size of about 36 kDa for BBa_K1172502, which is equated with a strong expression and overproduction of OprF. Furthermore we were able to identify the overexpressed outer membrane porin (Figure. 2) with MALDI-TOF MS/MS. MALDI-TOF MS/MS of the gel band thought to represent OprF and analysis with MALDI-TOF MS/MS confirmed the outer membrane porin with a Mascot Score of 222 against the bacteria database. In order to test the effect of the protein expression on the cell growth, growth curves were investigated. Figure 3: Growth curves for E. coli KRX with LB medium. Comparison between Escherichia coli KRX wild type and Escherichia coli KRX with oprF plasmids BBa_K1172501, BBa_K1172502, BBa_K1172503 and BBa_K1172507. oprF gene expression was induced for inducable promoters at OD600 = 1.0. All data are representing two biological and two technical replicates with standard deviation. E. coli KRX wild type shows the best growth characteristics with a maximal optical density OD600 = 4.0. E. coli KRX with oprF coding plasmid shows a slightly lower growth due to the higher replication stress. E. coli KRX expressing oprF under control of strong Anderson and lac promoters are showing 10% decreased maximal cell density and E. coli KRX expressing oprF under control of T7 promoter shows a further decreased growth which was 45% reduced in comparison to E. coli KRX wild type. This lower growth is based on an increased expression of oprF on the cellular surface and therefore on higher metabolic pressure, which was confirmed with different assays, which can be found in the further characterization of the outer membrane protein OprF. The heterologous expression of the outer membrane porin OprF will enhance the hydrophobicity of cell membrane. The outward-facing side groups on each of the β-strands of the OprF monomer are hydrophobic. Therefore, heterologous expression should be detectable by an increase in hydrophobicity. The Hexadecane-Hydrophobicity-Assay is based on different affinities to hexadecane of dissimilar cell-types according to their cell surface. Hydrophobicity can be observed by specific changes in OD600 of the aqueous phase. An increasing hydrophobicity of cell membrane changes the physicochemical properties of the cell. This could effect for example the cell-electrode interaction. Therefore, we investigated the cellular surface characteristic by comparing Escherichia coli KRX wild type with Escherichia coli KRX with BBa_K1172502, BBa_K1172503, BBa_K1172504, BBa_K1172505 and BBa_K1172507 (Table 2 and Figure 4). The OprF strain shows an increasing affinity to hexadecane with increasing promoter strength in comparison to the wild type. Cells in which OprF was expressed from the T7 promoter (BBa_K1172502) showed the maximal hydrophobicity, which was three times higher than the affinity to hexadecane of the wild type. Table 2: Results of the Hexadecane-Hydrophobicity-Assay. Comparison of hydrophobicity between Escherichia coli KRX wild type and Escherichia coli KRX with BBa_K1172502, BBa_K1172503, BBa_K1172504, BBa_K1172505 and BBa_K1172507. Affinity to hexadecane (hydrophobicity) with standard deviation and enhancement in comparison to the wild type is shown. Two biological and at least three technical replicates were analyzed. Figure 4: Results of the Hexadecane-Hydrophobicity-Assay. Comparison of hydrophobicity between Escherichia coli KRX wild type and Escherichia coli KRX with BBa_K1172502, BBa_K1172503, BBa_K1172504, BBa_K1172505 and BBa_K1172507. Affinity to hexadecane (hydrophobicity) with standard deviation and enhancement in comparison to the wild type is shown. Two biological and at least three technical replicates were analyzed. The enhanced hydrophobicity of OprF expressing strains indicates a successful expression of the outer membrane porin in Escherichia coli. Such an increased hydrophobicity on the outer membrane caused by the expression of OprF will lead to an increase in the cellular adhesion to the surface of the carbon anode and an enhancement of direct electron transfer from Escherichia coli to the electrode. Besides testing the outer membrane hydrophobicity for physicochemical characterization of the E. coli surface, we measured the membrane permeability by fluorescence-based NPN (N-Phenyl-1-naphthylamine) uptake assay for outer membrane morphology characterization (Helander and Mattila-Sandholm, 2000). NPN is a suitable chemical for measuring the membrane permeability of cells. An increasing NPN fluorescence intensity indicates an enhanced NPN uptake through the outer membrane and enhanced membrane permeability (Loh et al., 1984). 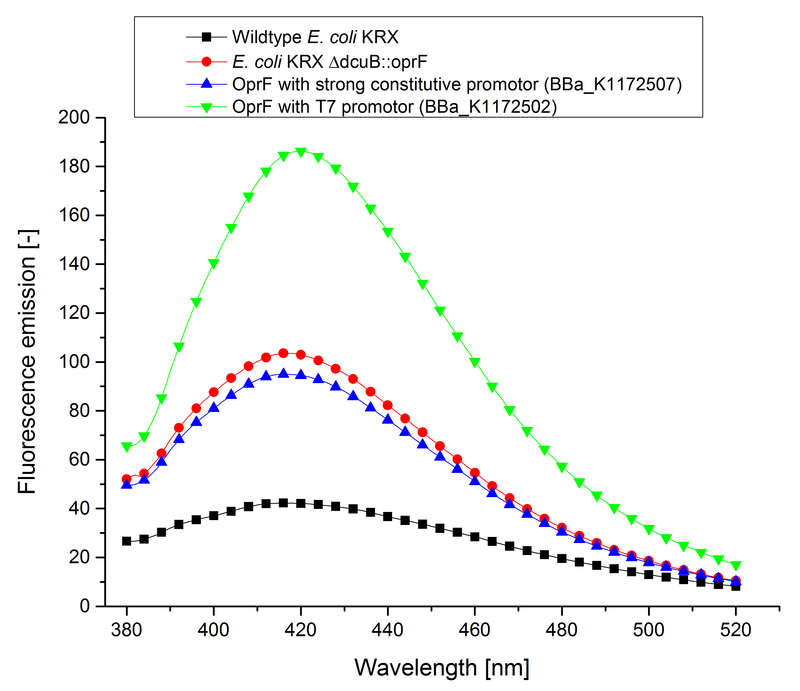 Figure 5 shows a higher fluorescence emission and hence higher membrane permeability with increasing promoter strength for OprF producing strains in comparison to Escherichia coli KRX wild type. Figure 5: Results of the NPN-uptake-assay. Comparison of fluorescence emission between Escherichia coli KRX wild type and Escherichia coli KRX with BBa_K1172502, BBa_K1172503, BBa_K1172504, BBa_K1172505 and BBa_K1172507. Excitation at 355 nm with fluorescence emission scan from 320 to 390 nm wavelength and with standard deviation. Two biological and at least three technical replicates were analyzed. Escherichia coli with heterologous expression of the outer membrane porin OprF shows more efficient NPN uptake than the Escherichia coli KRX wild type, suggesting an increased membrane permeability with increasing promoter strength. E. coli with oprF under T7 promoter control (BBa_K1172502) shows the maximal membrane permeability with 100% enhanced permeability in comparison to E. coli KRX wild type. The weak Anderson promoters seem unsuitable for heterologous expression of this gene. Another way of characterizing the outer cell membrane can be achieved with an fluorescence-based ONPG assay. This assay measures the membrane permeability by whole-cell lactase enzyme activity (Zhou et al., 2010). Electron shuttle-mediated electron transfer (EET) determines the transport efficiency of electron shuttles across the cell membrane. With the NPN uptake assay we were able to quantify the transport efficiency of chemical molecules across the cell membrane. In contrast, the ONPG assay (whole-cell β-lactase enzyme activity assay) measures not only the diffusion of ONPG into the cell but also the release of its hydrolytic product across the cell membrane. With the ONPG assay we are able to observe diffusion processes in and out of the cell membrane. Due to the fact that heterologous expression of oprF in Escherichia coli should not have an impact on the expression of β-lactase, we can assume that the β-lactase activity of E. coli KRX wild type and E. coli KRX with oprF expression plasmid is identical. All in all, the ONPG assay provides significantly more information than the NPN uptake assay. Figure 6: Results of the ONPG-uptake-assay. Comparison of ONPG hydrolysis between Escherichia coli KRX wild type and Escherichia coli KRX with BBa_K1172502, BBa_K1172503, BBa_K1172504, BBa_K1172505 and BBa_K1172507. Absorbance at 405 nm wavelength with standard deviation is shown. Two biological and at least three technical replicates were analyzed. The ONPG hydrolysis rate by β-lactase is much higher for E. coli KRX containing OprF plasmids in contrast to E. coli KRX wild type. Whereas we could only observe a minimal hydrolysis activity in the wild type, E. coli KRX, carrying OprF expression plasmids, shows a much faster ONPG hydrolysis rate with increasing promoter strength and a maximal rate for E. coli KRX with T7 promoter (BBa_K1172502), which is 30 times higher than wild type hydrolysis rate. In summary, we could prove that the heterologous expression of OprF from Pseudomonas fluorescens in Escherichia coli significantly improves the membrane permeability. The NPN and ONPG assay show comparable results. Outer membrane permeability of E. coli is enhanced with increasing promoter strength for oprF expression. The wild type shows only a weak uptake rate of chemical molecules (NPN) and no product release as quantified with ONPG assay. Therefore, the E. coli wild type is not well suitable for a usage in the MFC using mediators. In contrast, membrane optimized Escherichia coli with OprF shows increased diffusion across the cellular membrane, indicating a possible optimization of electron shuttle-mediated electron transfer (EET) to the anode and increasing current production. In addition to the morphological and physicochemical characterization of the Escherichia coli outer membrane, we wanted to visualize the surface. The technique of choice for this is Atomic Force Microscopy (AFM). After cell preparation we were able to get AFM pictures of the E. coli surface with the help of the working group of Prof. Dr. Dario Anselmetti, with special help from Dr. Volker Walhorn. Figure 7: Light microscopy of AFM layer after cell preparation of Escherichia coli KRX wild type. Figure 8: Light microscopy of AFM layer after cell preparation of Escherichia coli carrying oprF under the control of T7 promoter (BBa_K1172502). Enhanced cell clustering, caused by higher hydrophobicity, can be observed. Microscopy of the AFM glass layer after cell preparation, before AFM measurement, shows the different cell properties. Number of cells as well as magnification scale are the same. Escherichia coli KRX expressing oprF from a T7 promoter (BBa_K1172502) presents a clustering of cells, whereas the wild type forms a monolayer. Thus, the increased hydrophobicity of the cell surface is already visible even with an ordinary light microscope. AFM was carried out using the MultiMode® 8 AFM from Bruker. The measurements were performed on air with ‘Tapping Mode’ and in water with ‘Peak Force Mode’. Figure 9: AFM images of the cell surface for Escherichia coli KRX wild type and Escherichia coli KRX with heterologous expression of porin OprF (BBa_K1172502). Images are shown in Topography and Contrast mode. The heterologous expression of the porin OprF causes a slightly rougher membrane, the morphology and thus the viability of Escherichia coli is preserved to the greatest possible extent. All results so far indicated the potential for an increase in energy production. This assumption was confirmed by cultivation of Escherichia coli KRX with OprF (BBa_K1172502) in comparison to Escherichia coli KRX wild type in the Microbial Fuel Cell. Indeed, the extracellular electron transfer mediated by electron shuttles is improved in the OprF expressing strain resulting in an increased bioelectricity output (Figure 10 - 13). Figure 10: Microbial Fuel Cell results from cultivation of Escherichia coli KRX with OprF (BBa_K1172502) in contrast to Escherichia coli KRX wild type. Voltage curve from Escherichia coli KRX wild type, Escherichia coli KRX expressing OprF (BBa_K1172502), M9 medium with Methylene Blue as mediator and M9 medium without mediator is shown over time and over a resistance of 200 Ω. Figure 11: Microbial Fuel Cell results from cultivation of Escherichia coli KRX expressing OprF (BBa_K1172502) in contrast to Escherichia coli KRX wild type. Electric charge curve from Escherichia coli KRX wild type and Escherichia coli KRX carrying OprF (BBa_K1172502). M9 medium was used with mediator Methylene Blue and with measurement over a resistance of 200 Ω. Figure 12: Microbial Fuel Cell results from cultivation of Escherichia coli KRX expressing OprF (BBa_K1172502) in contrast to Escherichia coli KRX wild type. Electric power curve from Escherichia coli KRX wild type and Escherichia coli KRX carrying OprF (BBa_K1172502). M9 medium was used with mediator Methylene Blue and with measurement over a resistance of 200 Ω. Figure 13: Microbial Fuel Cell results from cultivation of Escherichia coli KRX expressing OprF (BBa_K1172502) in contrast to Escherichia coli KRX wild type. Average electric power bar chart from Escherichia coli KRX wild type and Escherichia coli KRX carrying OprF (BBa_K1172502). M9 medium was used with mediator Methylene Blue and with measurement over a resistance of 200 Ω.
Escherichia coli KRX with OprF (BBa_K1172502) shows 108 % higher maximal voltage than Escherichia coli KRX wild type with a maximum of 308 mV. Over the whole cultivation the voltage was improved by about 100 %. Tests using M9-medium with and without mediator Methylene Blue show no voltage, indicating that bioelectricity generation is solely due to the bacteria. The calculation of the electric charge confirms the described results. Electric charge is equivalent to the number of transported electrons and is enhanced by 111 % for Escherichia coli KRX with OprF (BBa_K1172502). The maximal electric charge of 7,2 C demonstrates that heterologous expression of outer membrane porin OprF enhances extracellular electron transfer dramatically. High membrane permeability is crucial for efficient mediator transport across the membrane and therefore for high bioelectricity generation. Finally, the calculated power curve shows 239 % enhanced electric power for Escherichia coli KRX carrying OprF (BBa_K1172502) with a maximal electric energy transfer rate of 475 μW and a 300% enhanced average electric power. Cell membranes are protective layers, which are crucial for physiology of the bacteria. In consideration of the Microbial Fuel Cell, the cell membrane is also a barrier which decreases mediator and thus electron exchange between bacteria and anode. With heterologous expression of the outer membrane porin OprF from Pseudomonas fluorescens in Escherichia coli we were able to enhance membrane permeability. With this optimized cell membrane surface we generate an efficient electron shuttle-mediated EET with decreased limitation of EET by membrane barrier. In contrast to a perforation of the membrane with chemicals, cell viability is maintained with OprF expression (Liu et al., 2012). Beside improvement of EET, enhanced hydrophobicity shows optimized cell adhesion to the anode for biofilm formation and direct electron transfer. The heterologous expression of OprF is a genetic strategy to optimize electron shuttle-mediated electron transfer as well as electricity generation in Microbial Fuel Cells. The most suitable and efficient OprF device for Escherichia coli is a combination with the rhamnose inducible T7 promoter (BBa_K1172502). The funtionality of the outer membrane porin OprF (BBa_K1172507) in E.coli KRX ΔdcuB::oprF was investigated with a NPN-Uptake-Assay (Cheng et al., 2005). Figure 14: Results of the NPN-Uptake-Assay. Comparison between Escherichia coli KRX wildtype and Escherichia coli KRX with BBa_K1172507, BBa_K1172502 and Escherichia coli KRX with genome integrated oprF gene (E.coli KRX ΔdcuB::oprF). Figure 14 shows the results of the NPN-Uptake-Assay. Higher fluorescence emission and higher membrane permeability could be observed with increasing promotor strength for oprF. The genome integrated oprF shows mid-level fluorescence emission and membrane permeability. Highest fluorescence levels could be measured with the oprF gene on a high-copy pSB1C3 plasmid under control of the T7 promotor. Genome integrated oprF showed almost the same membrane permeability as the constitutive expressed oprF with BBa_K1172507. There even seems to be a marginal higher expression of the genome integrated oprF in contrast to the plasmid coded oprF although the same constitutive promotor (BBa_J23104) is used. This could be explained by physiological condition of the cell. Constitutive expression of the high-copy oprF causes cell stress. Protein expression could be automatically downregulated by the cells. The single-copy genome integrated oprF showed a reduced expression level, therefor cell stress is also smaller. As a consequence E. coli cells showed a more effective expression of the outer membrane porin OprF adjusted on physiological cell condition. So we constructed a stable E. coli strain, which shows constitutive expression of outer membrane porines OprF because of genome integration of oprF gene. We improved characterization of BBa_K1172501 via NPN-Uptake assay. Fluorescence emission was measured between 380 and 520 nm. 1-N-Phenylnaphthylamine (NPN) shows maximum fluorescence at 415 nm by excitation wavelength of 355 nm. iGEM13_Bielefeld-Germany measured fluorescence emission maximum at 355 nm, which leaded to similar results but has to be attributed to reflection effects during measurement. This assay has been used to measure cell membrane hydrophobicity. AFM: During the last years, atomic force microscopy has been used increasingly to investigate microbial surfaces at high resolution. The technique provides three-dimensional images of the surface ultrastructure with molecular resolution, in real time, under physiological conditions, and with minimal sample preparation. Inoculating an overnight culture (30 mL with 1 mL of pre-culture) and induce gene expression if necessary at OD600 = 1.0. Centrifugation (5 min at 5000 g) of 2 mL overnight culture (OD600 5 ~ 1 ∙ 109 cells/mL). Discard supernatant and wash pellet 3 times with 1 mL of ultra pure water. Resuspend pellet in 2 mL ultra pure water (2 ∙ 109 cells). 10 minutes sonication of glass slides in acetone. 10 minutes sonication of glass slides in ethanol. 10 minutes sonication of glass slides in ultra pure water. Dry glass slides under gentle N2 flow. Drop 5 μL of a 1:4 dilution of prepared cells (1,25 ∙ 106 cells) to the prepared glass slides for a submonolayer coverage. Dry glass surface with cells under gentle N2 flow. Wash glass surface three times with ultra pure water and dry between under gentle N2 flow. The coated glass slides were kept cool until AFM measurement. Inoculate an overnight culture (30 mL with 1 mL of pre-culture). Centrifugation (8 min at 3000 g) of the whole overnight culture and discard supernatant. Resuspend pellet in equal volume of 10 mM PBS buffer. Repeat steps 2) and 3) twice. Mix 1 mL of washed cells with a 10 mM stock solution of NPN (1 N phenylnaphthylamine) to a final concentration of 10 µM. Transfer 200 µL of samples to a flat bottomed black 96 well plate. Direct fluorescence measurement with Tecan Infinite® M200 platereader. Inside a clear, flat bottomed 96 well plate, mix 180 µL ONPG (o-nitrophenyl-b-galactopyranoside) stock solution (3 mM in 10 mM PBS buffer) with 20 µL of washed cells. Direct absorbance measurement with Tecan Infinite® M200 platereader. Modified protocol from Neu & Heppel, 1965. Here you can find the used different Cell Fractioning Buffers. MALDI-TOF MS/MS: Vera Ortseifen gave us support dealing with protein analysis by MALDI-TOF MS. After our sample preparation and tryptic digestion she measured the samples and also provided help in the data analysis. Atomic Force Microscopy: The working group of Prof. Dr. Dario Anselmetti, with special help from Dr. Volker Walhorn, measured our self-prepared AFM glass slides and visualized the cell surface of Escherichia coli with porins by atomic force microscopy. Hancock REW, Brinkman FSL (2002) Function of Pseudomonas porins in uptake and efflux. Annu Rev Microbiol (56):17–38. Helander IM, Mattila-Sandholm T (2000) Permeability barrier of the gramnegative bacterial outer membrane with special reference to nisin. Int J Food Microbiol 60: 153–161. Liu J, Qiao Y, Lu ZS, Song H, Li CM (2012) Enhance electron transfer and performance of microbial fuel cells by perforating the cell membrane. Electrochem Commun 15: 50–53. Logan BE (2009) Exoelectrogenic bacteria that power microbial fuel cells. Nat Rev Microbiol (7): 375–381. Loh B, Grant C, Hancock REW (1984) Use of the fluorescent-probe 1-Nphenylnaphthylamine to study the interactions of aminoglycoside antibiotics with the outer-membrane of Pseudomonas aeruginosa. Antimicrob Agents Chemother 26: 546–551. Zhou ZX, Wei DF, Guan Y, Zheng AN, Zhong JJ (2010) Damage of Escherichia coli membrane by bactericidal agent polyhexamethylene guanidine hydrochloride: Micrographic evidences. J Appl Microbiol 108: 898–907.